Are Your Retirees Taking Their Knowledge With Them? Are You Letting Your Retirees Take Their Knowledge With Them? A new survey in the UK has added more fuel to the burning question of how organizations can retain the knowledge of their experts even after those employees retire. According to CIPD, the UK’s professional body for HR and people development, almost a third of the UK’s existing workforce expected to retire within the next 20 years. Warning that businesses are facing significant skills shortages in the future, Ben Willmott, Head of Public Policy at the CIPD, contends that businesses need to be much more strategic about transferring knowledge from existing staff to newer employees to address the challenges presented by large-scale staff retirement. Of course, these issues are not just confined to the UK – they are playing out in various industries all over the world. An article published in the Harvard Business Review called ‘What’s Lost When Experts Retire?’ included an example from just a single company facing a wave of retirement that will entail the loss of 700 employees with over 27,000 combined years of work experience. And while the now-underway retirement of the baby boomer generation will affect every industry, a few are set to feel the effects even more acutely. In the oil and gas sector, for instance, 50% of experienced workers are going to retire in the next 5-10 years, posing significant challenges for organizations operating in this market. While outlining the scale of the challenge, the CIPD report also highlights five key ways in which companies can mitigate the risks posed by a substantial loss of experienced and highly-skilled workers. Perhaps most important of the ideas offered is investment in training and staff development, and identifying opportunities for established, outgoing employees to transfer their knowledge via mentoring, coaching and upskilling newer staff members. As the New York Times has noted, video has increasingly become a valuable tool for capturing, preserving, and sharing institutional knowledge. With video, experts can efficiently and thoroughly document their know-how — from simple screen recordings of how to update a database or troubleshoot a server to convenient mobile-phone or webcam videos of how product assemblies work, how field installations are performed, how customer ecosystems can be modified for best results, or virtually anything else. And because video can be easily saved for later viewing, recording your retiring employees’ institutional knowledge can be an easy way to ensure future employees can learn from their experience — even if their tenures never overlap. Many organizations have tried documenting the insights of their experts before — but came away with documents either too long and dense for new employees to bother to read, or with high-level reviews that quickly fell out of date. So What Makes Video Different? Depth. Some of the industries that will be most affected by the impact of large-scale staff retirement rely on highly specialised, highly technical processes. Documenting a procedure in writing can be time-consuming from the perspective of the person trying to transfer the knowledge and confusing for the new learner. By allowing a subject matter expert to capture a procedure in the moment, and in its practical setting, the process can be communicated much more swiftly and effectively. Showing, rather than telling, enhances the whole knowledge transfer process. Much of the value represented by your experienced workers is in how they execute their tasks, not just what they do. However, many staff are unaware themselves of the myriad subtleties in the way they carry out their everyday activities. Video can illuminate many of these hidden nuances, revealing ‘tricks of the trade’ that would otherwise leave the business along with the employee. 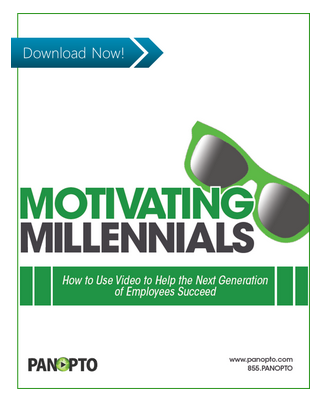 As we’ve detailed in our white paper on ‘Motivating Millennials with Video’, future generations of workers will arrive at their new companies having been immersed in video throughout their earlier learning experiences. For many companies, connecting this generation with long-serving staff members will be critical in fostering consistency between the outgoing workforce and newer cohorts. Choosing a compelling training and communications medium like video maximises the chance newer team members will fully engage with the employee training and upskilling process and gives them a resource that they can revisit time and time again to sense-check their understanding – even after their more experienced colleagues have retired. If you are thinking about how to transfer knowledge effectively within your organisation and enhance employee training, you can get in touch with us to set up a free 30 day trial. If you’d like to see the system in action, you can request a demo.